"Music is a fair and glorious gift from God. I would not for the world forego my humble share of music. Singers are never sorrowful, but are merry, and they smile through their troubles in song. Music makes people kinder, gentler, more staid and reasonable. I am persuaded that after theology there is no art that can be placed on a level with music; for besides theology music is the only art capable of affording peace and joy of heart...the devil flies before the sound of music as much as before the Word of God." 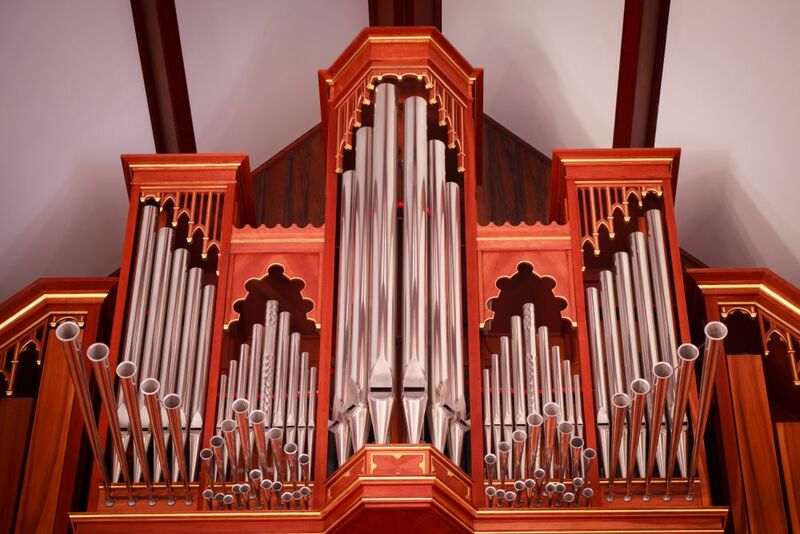 On April 25, 1993, St. John's Lutheran Church dedicated a two manual mechanical action pipe organ designed and built by the J.F. Nordlie Company. John F. Nordlie shared, "The design of any new organ takes on a certain resemblance to things of the past. The organ at St. John's, while not being a copy of any one historic instrument, is an eclectic instrument drawing elements of visual and aural design from some of the finest examples of the past. The instrument has a warm, rich, cohesive sound with a wealth of color. Projecting a sound appropriate for much of the music written for pipe organ, it is equally suited for the demands of the Lutheran church service. The organ enhances and strengthens St. John's exuberant hymn singing and exciting music program." The casework is constructed of solid American cherry, stained and finished with hand-rubbed oil and wax. The visual plan of the main case is modeled after the late Gothi organ (1467) at Kiedrich im Rheingau; molding profiles are copies of those found on the Evert organ (1560) in Innsbruck's Hofkirche. The moldings and pipeshades are accented in 23K gold leaf and dusky red lacquer. A balanced expression pedal controls the Swell shades located behind the central decorated grill. The front pipes -- Prestant 8' and Festival Trumpet 8' -- are constructed of 80% polished tin. The Prestant 16', of stained and lacquered poplar, stands in the pedal tower facades. Interior pipes are made of tin/lead alloys, brass, copper, and poplar. The temperament (after Vallotti) aptly suits Lutheran liturgy and hymnody. The console, attached to the lower main case, incorporates a keydesk of black walnut. The 58-key manuals have naturals plated with polished cow bone and ebony sharps. The 30-key concave-radiating pedalboard has maple naturals and black walnut sharps. Ebony drawknobs with engraved cow bone faces are angled towards the keydesk in convenient stopjambs. The matching walnut-topped bench is adjustable. The stop action of the organ is driven by electric solenoids controlled via a solid-state combination system. All divisional, general and tutti pistons & toe studs, plus programmable reversibles and crescendo pedal are available at ten (10) memory levels.